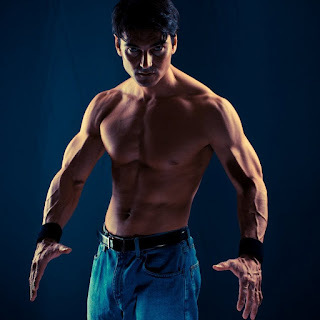 Speculative Romance Author Regina Paul: Interview with Romance Cover Model Jason Aaron Baca 404 ~ Page Not Found! 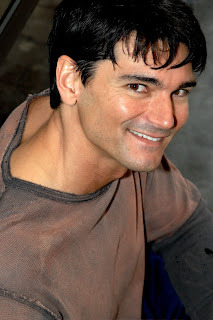 Today I've got romance cover model Jason Aaron Baca visiting my blog. I had the pleasure of interviewing Jason for this post and learned a lot about him, and a bit about how this whole cover model thing works as well. So, if you ever wanted to know something about the guys that pose for romance novel covers, this interview will most likely be an eye opener! 1. Please tell readers a bit about yourself. Sure, well I am a Bay Area Native.. Grew up in a town called Los Gatos, CA. I played baseball in high school and college. I later became a double in movies which is where I got my first modeling gig while on location for the movie I Know What You Did Last Summer. After 10 or so years of modeling I found out about romance novels and how I fit perfectly into the mold. Currently there are more then 84 covers out there. 2. Please share with readers some of the things you like to do when not modeling. I love to travel to calm, quiet places. Places where there won't be any disturbances or trouble. Places include Hawaii,Bahamas, and any Tropical place that has bright blue waters that I can dip my feet into without freezing them off. Besides the traveling, I do enjoy fitness a great deal and can often be found in a health club. 3. How did you get your start as a model? As a romance novel model it took a lot of determination and follow ups on my part to get these guys to want to use me. I went an entire year where I'd just promoted myself to the publishers offering them select photos of me from past shoots that they could use for cover art. Then after that promotional period came the shoots. I was contacted short after by a Graphic artist that needed a specific type of pose of me.. She wasn't too far off from where I lived either so she shot me at her studio. 4. What made you decide that you wanted to model for romance book covers? I get this question a lot.. It was fitting for me. It was something that I found out about as I was in a Barnes & Noble one day. I had looked at one of the romance novels and saw one of the cover guys. I felt I had him beat. I wanted to be him and was anxious to find out how to become one of them. 5. What is your favorite romance cover so far that has been done with you? 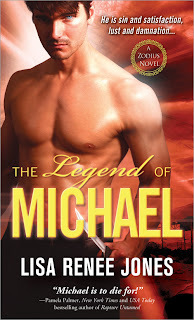 I would have to say "The Legend Of Michael" by Lisa Renee Jones. 6. If someone wanted to use one of your photos for a romance book cover, where would they go to purchase a photo? 7. What do you like the best about posing for shots that will be used on romance book covers? I enjoy every aspect about it. It is the greatest feeling in the world knowing that when I go pump up at the gym, I am doing it for a romance novel. I love working out in the gym, so can you believe how much I am in heaven? I get the satisfaction of working out, then I get the feeling of going to the studio and posing for you guys. It's very rewarding to my ego that is for sure. 8. What do you least like about posing for these shots? I can't say I don't like a particular part of this. Sure it can be difficult to say no to certain foods that taste and smell just right but then I imagine how much more delicious to my palet it will be once I land that big cover so I don't mind saying no to tasty things. BUT I feel compelled to mention, when I do take my time off (which I sometimes do) I will reach for a Mr.Goodbar or Reese's Peanut Butter Cups. I can't help myself and if the companies that made those knew of my cravings for them, they bring them to my house by the truck load.. Why I'd be in debt to them for life! 9. If you could change one thing about your journey to being a model, what would it be, and why that one thing? I would have figured all of this out earlier in life! I look back often and say "Why didn't I get going on this stuff before?" I confused myself with ordinary ideas. I'd listen to unsuccessful models ideas on how to be a top model. I should have only listened to the best in the business or just my own ideas. 10. Do you have any advice for aspiring cover models? Yes I do. If you are really serious about this then do one thing every day toward your goal. It could be as little as sending out an email or as big as arranging 5 photo shoots for next week. Whatever it is, stay in your tunnel vision and don't let anyone tell you otherwise.. There will be low moments when you are down and feel nothing will ever go your way then there are those other moments you love.. the moment you see yourself on the cover of a big novel displayed when you first enter a bookstore. 11. If a publisher wanted to book you to do a shoot for them, how would they go about it? Hi there, Jason and Regina :) I really enjoyed your interview. Jason is actually on the cover of my novel that just released - Hart's Destiny. I was thrilled when my publisher asked me about using your figure, Jason. Thank you so much for all the wonderful covers you do and all the inspiration you give authors and readers alike. Have a great day! Excellnt article. I agree with the others. Love your covers. Love your body. Must check out your website - would love to know about your covers and what is availab;e. Regina Paul - - you did good. And I love your stuff too. I like the second and third pictures better than the Michael cover. Oh, I loved 'A Place To Land' Mary :) I think it is too difficult to choose among Jason's covers. They are all so beautiful. The model on the cover of my first release came to new Orleans with us and signed books at the Vampire Lestat Ball. I love it when models interact with readers! !